My fiancé suddenly found that all of the icons on her Home screen were much larger in size than they used to be. She accidentally enabled the TouchWiz easy home to be her default Home screen by selecting it on the “Complete action using” dialog. To fix this issue, she simply had to clear the the application as a default using these steps. Tap the “Clear” button next to “TouchWiz easy home“. 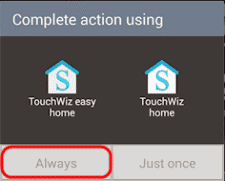 When prompted with the “Complete action using” screen, choose “TouchWiz home” (right option). yep happened to me could not get round it that way….if you had a personal home screen, or if you want one….go in to Samsung themes app….there are loads of free ones…scan through them or search….say,cats….or mountains……I’ve got RED and this changes the icon styles scroll to the left for examples of how it looks….then press APPLY .at the top right of screen.😁 hope tbis helps …. I was going crazy and even contemplating getting a new phone. I knew I had touched “TouchWiz” and I don’t know why. I also knew it should be in my apps but just learned about a separate place for default apps. Thank you! Thank you so much. It worked fine. I too was in a state of panic as a lot of my icons disappeared. Thank You Thank You!! New phone and I just could not figure it out! You hero! I did exactly this and it has driven me mad for a week trying to find out how to reverse it!! Thank you! I must say the Wall Stree Journal is right about Samsung’s version of the Android operating system — it’s horrible. They should just stick to the plain vanilla versoin provided by Google. Thanks this article is helpful. Thanks dude all is back to small icons. Shot for the info.